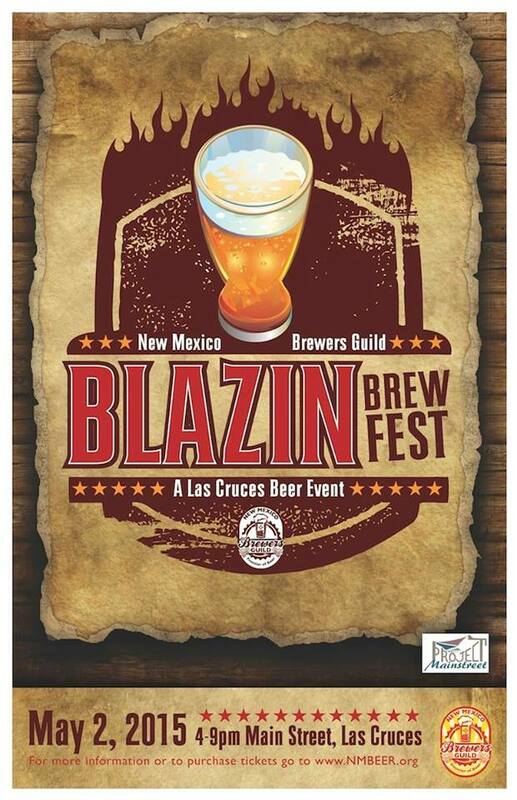 The annual Blazin’ Brewfest is set for today (Friday) along Main Street in downtown Las Cruces. A total of 18 breweries will be present, some from as far away as Abiquiu, Clovis, Santa Fe, and Taos, to many of the Albuquerque breweries and the locals down south. Things kick off at 5 p.m., with tickets costing $20 per person. There may still be some online and more available at the gate while supplies last. This is a NM Brewers Guild event, so if you are in Southern New Mexico/West Texas, or are willing to make the drive down, please show up and support the Guild. Need any final convincing? How about knowing what’s on tap? We have 15 of the 18 breweries’ lists, and will add the others if they pop into our inbox. We put some of our favorites in bold from the breweries we visit regularly here in the ABQ and Santa Fe areas. Try those, try different ones, just do whatever makes you a happy beer lover. If you head out tonight and have some pictures you would like to share far and wide on social media, send them over to nmdarksidebrewcrew@gmail.com, or to any of our pages on Facebook, Instagram, or Twitter. Just stay safe and have a great time. Here’s to supporting local beer! Picacho Peak Brewing is one of the newest breweries to hit the Borderlands, specifically Las Cruces. It’s tough to find as the area sits back off the road, but you will be looking for Grapevine Plaza and the gate will be on your right. 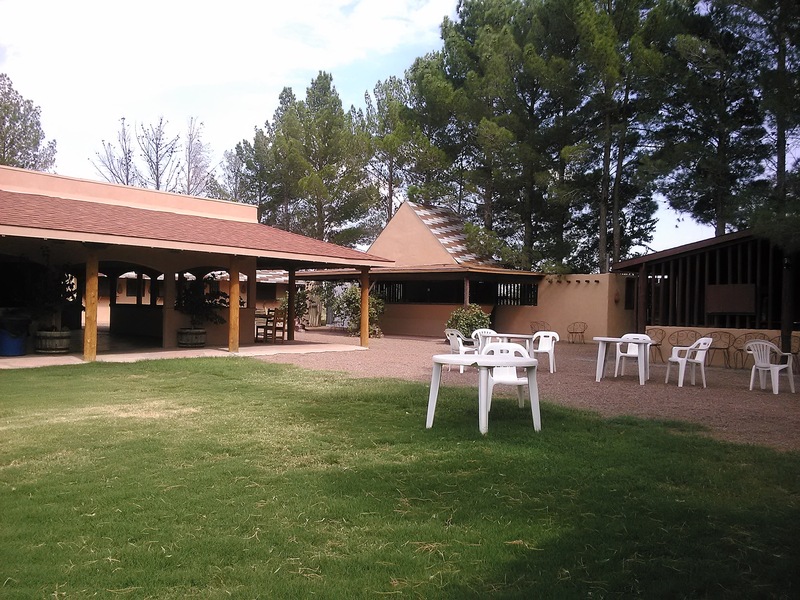 Walking up to the place you notice that there is a lot of room to grow with numerous building on the property. 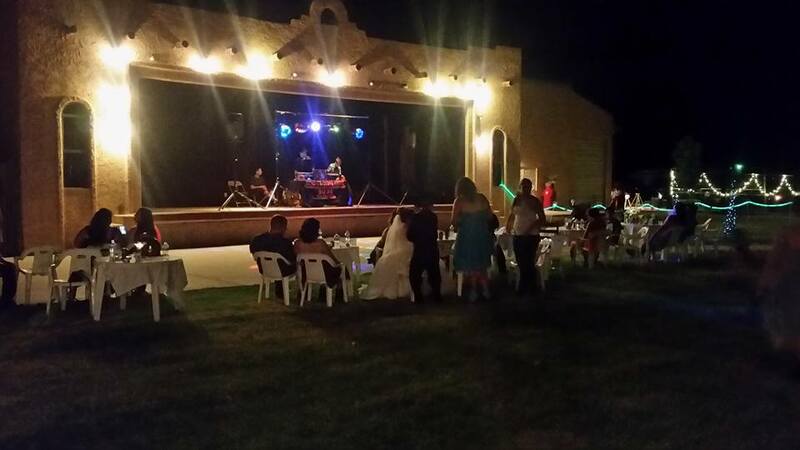 They even have a large stage and chairs set up outside that you can move together or into the shade if needed. Dogs are welcome to Picahco and the grassy area was a welcome feeling to our pooch after a day at the lake. They were very accommodating and even brought out some water for him. The amount of space is great for hanging out with a bunch of people. Once outside and after moving the table to the shade, we were met by our waitress, the daughter of the owner. It truly is a family affair. His son, Derrick, poured the beers behind the bar and took the check when we left. Even the grandparents had stopped in for a drink. They do have food on the menu and they were very open to making just about anything you could ask for if they had the ingredients. We had the chips and queso dip just to hold us over until dinner. The queso dip had just enough kick for us to know it was there. It was most likely not enough for people who enjoy hot stuff, but for us it was enough. It looked to be homemade and the price wasn’t bad, either. The queso paired well with most of the beers. I don’t really recommend queso dip and the smooth and stout though, I think that threw some taste buds off. 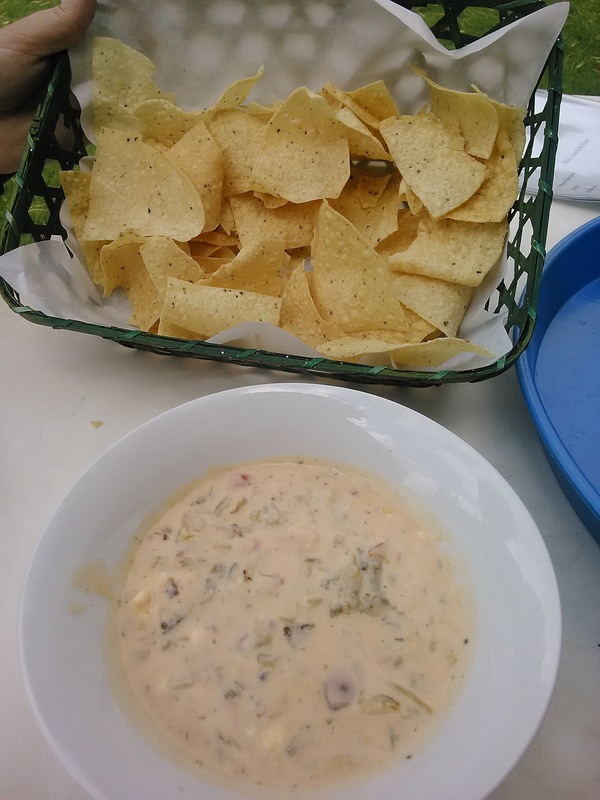 Just some queso and chips for a late lunch. 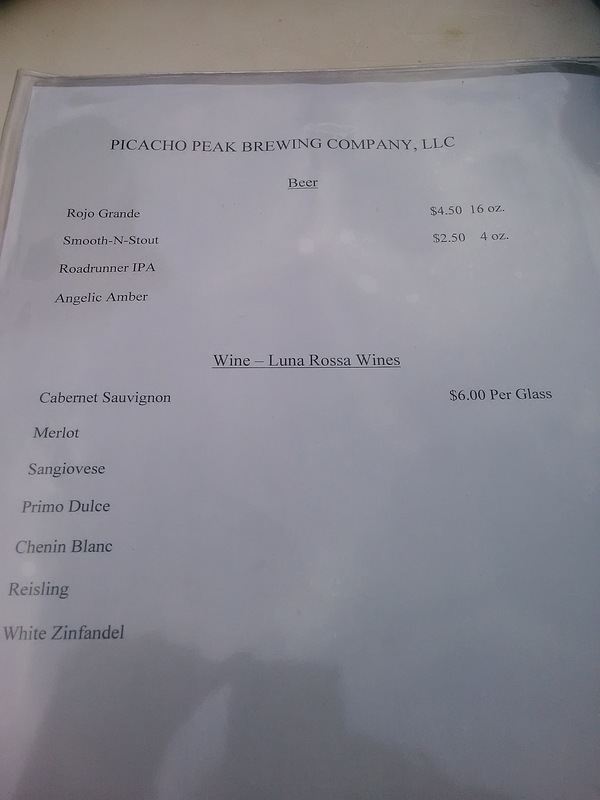 Picacho Peak serves five beers right now. None of the beers are particularly summery, but the IPA was light enough that it was decently refreshing for the 100-degree heat Las Cruces had when we visited. The Road Runner IPA comes in at 7.8-percent ABV and was not very hoppy for an IPA, so even a non-hophead would enjoy it. Four of the five beers were on the list along with wine by the glass for those non-beer drinkers who still want to have some fun. The Javelina Black IPA has more of a malty base and is just as dark as the Smooth and Stout. My wife had to help out and tell me which was which, because they looked so similar. It was smooth to drink and overall not a bad black IPA. There was not much hop bite, but it does shine through just enough to know it’s an IPA. Rojo Grande has a great reddish hue and is a very drinkable lager type of beer. Angelic Amber lives up to the name of Angelic, as it truly is heavenly. Overall, it has great body and the drinkability is high. The amber coloring and good taste would make this a great fall beer for sitting out and listening to some music at Picacho Peak. The Smooth and Stout is just how it sounds. This type of beer is not my go-to choice on a 100-degree day, however it is still a solid choice for maybe when it gets to 40 or 50 degrees. 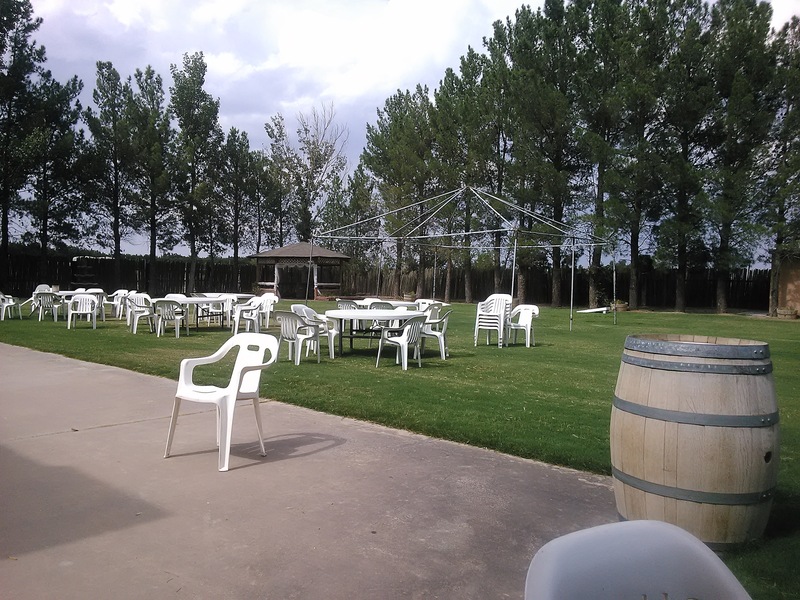 Picahco Peak Brewing would be a great place to hang out and catch some live music, which seems to be an ongoing theme judging by their Facebook page and the amount of events they are planning. They have plenty of seats and they also have sand bags, so you can play a game while drinking one of your favorite brews. Picacho has plenty of room to grow on their property and I wish them all the luck in their newest endeavor. Another view of the space for beer drinkers to relax and have a good time. The stage is off to the left outside the picture. So if you are hanging out in the Las Cruces area and just want a chill place to have a beer and hang out with friends, then try out the newest brewery in the Borderlands. The third annual Blazin’ Brewfest will hit Las Cruces this Saturday from 4 to 9 p.m., officially kicking off festival season in New Mexico. The event will be held again on Main Street, with plenty of food trucks and live music to go with the offerings from 15 different breweries, including the event’s four host breweries — Bosque, High Desert, Pecan Grill & Brewery, and Spotted Dog. It will mark the second New Mexico Brewers Guild event of the year, following WinterBrew in Santa Fe back in January. You can buy tickets online or at the breweries/taprooms in Las Cruces, or they will be $20 at the gate. The ticket gets you a souvenir glass and sample tickets. As we try to do for every major festival, especially those supported by the Guild, we put out the call for beer lists so those attending have advance notice of what they are in for this weekend. Unfortunately, we have not gotten many lists yet, but we will keep updating this post and letting you know when it is updated via social media right up until the event starts. None of the Crew can make the trek southward again this year (it falls on a double birthday weekend, for one thing), but keep an eye out for friend of the Crew and possible future Las Cruces correspondent Eric Dust, who hopefully (HINT) will write up something on the event. The beer lists, as provided by the breweries. Bosque: Pale Ryder, Brewer’s Boot Amber Ale, Scotia Scotch Ale, Bosque Pale Lager, Equinox SMASH, Bosque Lager. That’s four quality house beers, plus two seasonals in the Pale Lager (had it Wednesday, should be perfect in the afternoon heat) and the new Equinox SMASH, a single-hop and single-malt ale. High Desert: IPA, Peach Wheat, Hefeweizen, Bohemian Pilsner, ESB, Brown Ale, Stout, Oktoberfest. Those beers will be there for sure, plus they teased that there may be some surprise beers there as well. Pecan Grill & Brewery: They dropped the “De La Vega’s” portion of their name, plus they are brewing on site now. All they told us was that they will be bringing a number of specialty beers created at their brewer, not contract-brewed up at Rio Grande/Sierra Blanca in Moriarty. Red Door: Gateway Blonde Ale, Unhinged Cider, Threshold IPA, Roamer Red. Seriously, Las Cruces, for those of you who love ciders, Unhinged may be the best in the state. And because it’s there, you can take your gluten-free friend(s) to the event. Santa Fe: Happy Camper IPA, Java Stout, Black IPA, Freestyle Pilsner, Pale Ale, State Pen Porter, Nut Brown. All the crowd favorites. Spotted Dog: Much like Pecan, they are promising to bring some unique beers to the festival, but would not name them. So think of it all as a big surprise. Part two. Tractor: Farmer’s Tan Red Ale and Mustachio Milk Stout in cans; Apple Cider, Branding Iron DIPA, and Cowboy Blend Coffee Pale Stout on tap. Three staples and two seasonals from opposite ends of the spectrum. Turtle Mountain: Brohemian Pilsner, Oku Amber, Hopshell IPA, Stauffenberg Stout. In addition to those, there will be limited samples of Wilde Jagd, TMBC’s first bottled beer, plus some bombers for sale. Sorry we could not get all the breweries’ lists this time around. Hopefully we will have better luck when Bearfest and Blues & Brews go head-to-head in late May. Oh, and for the Outside Bike & Brew Festival in Santa Fe before that. Good lord May is going to be busy.